Fig. 1-2-2-1 shows the number of persons newly received by public prosecutors for violations of the Minor Offenses Act (Act No. 39 of 1948) and the Firearms and Swords Control Act over the last 20 years (See Appendix 1-4). The number of persons received for Minor Offenses Act violations was on an increasing trend in recent years, and which was particularly noticeable from 2004. However, it turned to follow a significantly decreasing trend from 2010, and significantly decreased again in 2011 to 10,968 (down 20.5% from the previous year). 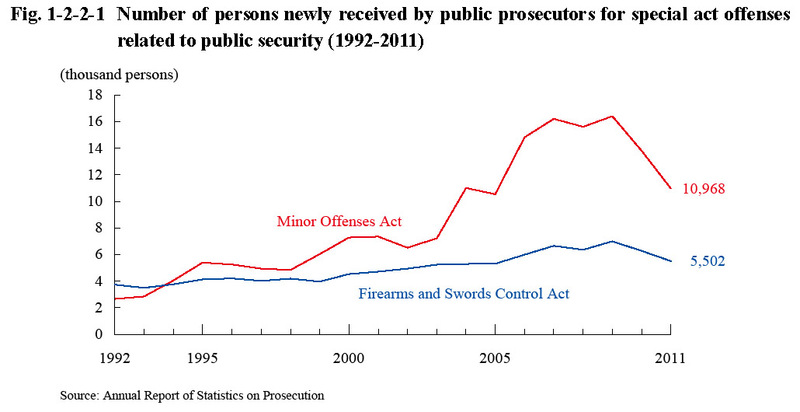 The number of persons received for Firearms and Swords Control Act violations was also on an increasing trend in recent years, but then turned to follow a decreasing trend from 2010. It was 5,502 in 2011 (down 12.4% (id.)). The number of persons newly received by public prosecutors for violations of the Act on Prohibition of Possession of Special Picking Tools was 409 in 2011 (down 20.4% from the previous year) (See Appendix 1-4).